Reaching the cool mountain forests west of Grants Pass was a relief, after driving through the hot Willamette and Umpqua valleys from Portland on an early July day. Dipping down into California before re-entering Oregon, we finally arrived at our destination of Brookings, the southwesternmost town in our state. My husband and I checked in to the Ocean Suites Motel, an establishment off the beaten path but right next to the town’s small harbor. We strolled across the road, got our first real whiff of salty sea air and watched the seagulls flock along the docks around the commercial fishing boats. The smell of fresh seafood made me hungry, so we headed into the main part of town for an early dinner. 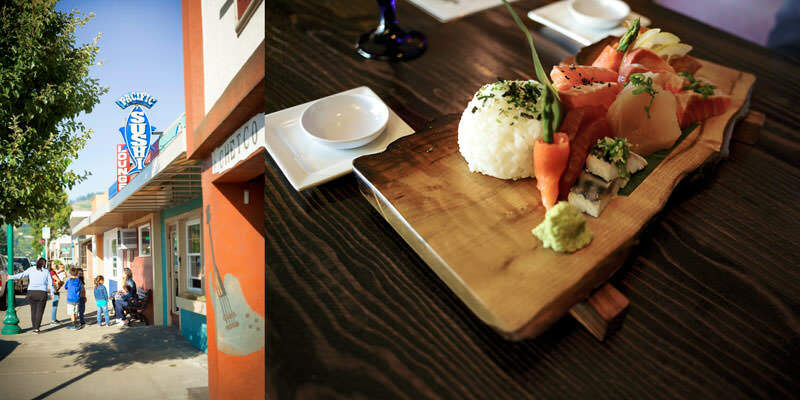 Pacific Sushi & Grill offered us a perfect meal: salty edamame, beef and vegetable stir-fry udon noodles, and exactly what I had been craving — fresh fish! We ordered the chirashi, letting the chef choose the best sustainable sashimi for us, and it was both beautiful and satisfying. I had read that Brookings is primarily a retirement community, but the people we encountered were younger, like the three hefty, mustachioed men who swayed back and forth to reggae music over their Miller High-Lifes in the bar side of this restaurant. 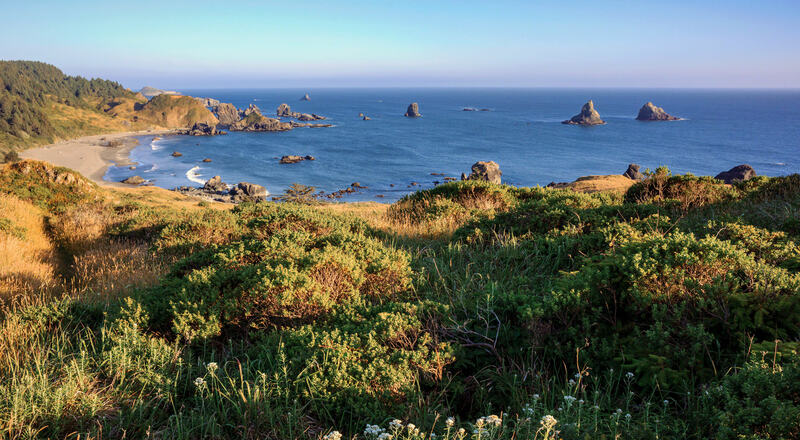 After an excellent meal, we took an easy hike along the coast at Cape Ferrelo, less than 15 minutes north of Brookings in the Samuel H. Boardman State Scenic Corridor. Amid the tall grass, at least a dozen varieties of wildflower were in bloom, including tall spikes of pink foxgloves, lacy white clusters of cow parsnip, cheerful white and yellow oxeye daisies, delicate yellow bonnets of bird’s foot trefoil and purple cones of lupine. With nearly no one else in sight, we took in the charming views of crescent-shaped sandy beaches and cairn-like rocks that churned up the ocean spray below us. As we hiked down to a small beach north of the cape, I could feel the fresh ocean air cleaning the city out of my lungs and the uninterrupted wild nature that surrounded us refreshing my soul. From our secluded beach we enjoyed the sunset, watching it turn the clouds, the horizon, and the froth of the waves to gold, pink and violet. It was a great way to begin our trip to the Klamath Mountains region. The next day, after a classic American breakfast at the Downtown Coffee Lounge, we headed off to the nearby Redwood Nature Trail, up the Chetco River. I had been reading about the ecology and history of coast redwood forests and was thrilled to be surrounded by these old-growth trees. 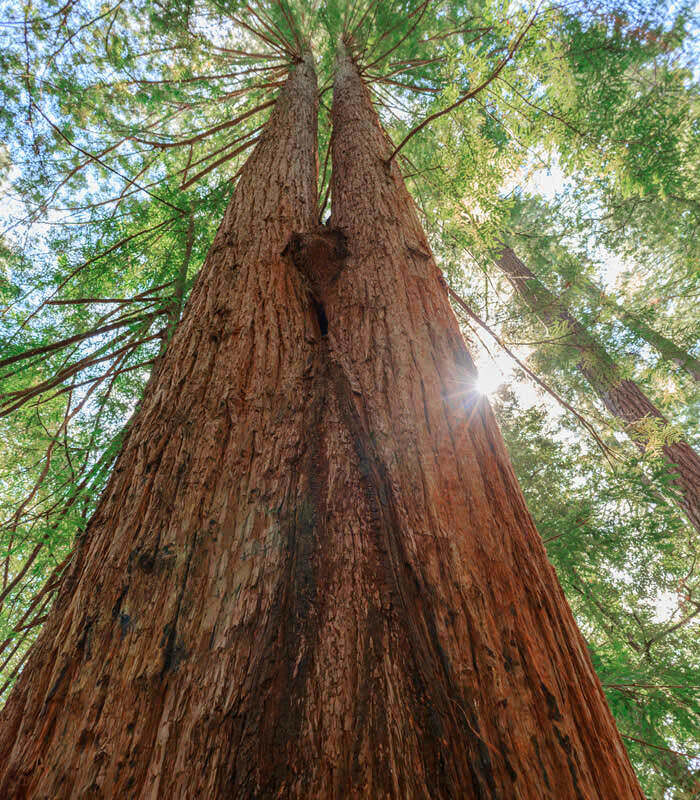 I knew that some of them have been alive since the Middle Ages, and that the massive “goose pen” in one tree that I could stand inside was caused by fire — redwoods being so resilient and strong, they can withstand the flames that hollow out the center of their trunks and still live and stand tall. I recognized clones growing from damaged trees, sometimes creating a “fairy ring,” another sign of the redwood’s amazing ability to survive. After completing the easy loop through the big trees, we crossed the road to the beginning of the Riverview Trail that runs along the Chetco River through myrtlewood trees in Alfred A. Loeb State Park. A lovely smell filled the air from the Oregon myrtles, which are similar to Mediterranean bay laurel. This wood is also prized, giving rise to Save the Myrtlewoods, a group that donated the land to the state to preserve these lovely trees. After a picnic by the river, we continued north into the Kalmiopsis Wilderness. When the former island chain that is the basis of the Klamath Mountains collided with the North American continent, the force was so great that the Earth’s mantle was lifted above the ground. A mountain ridge of rock called peridotite was created and has since oxidized, turning from green to rust red. 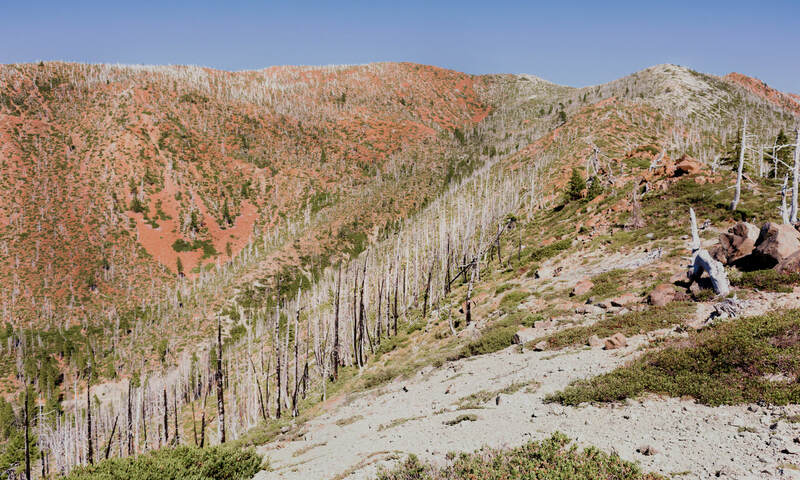 In 2002, fire destroyed the forest that once covered these slopes, dramatically revealing its red rocks. Being so barren, the trail up to a high point known as Vulcan Peak was a hot one, though only moderately steep. Unfortunately, one of the few trees left alive had snapped and fallen across the trail, preventing us from making it all the way to the top, but we still got a close-up view of this unique landscape and an overview of the vast Kalmiopsis Wilderness around us. In the morning, we were on the road again, to visit the Oregon Caves National Monument. 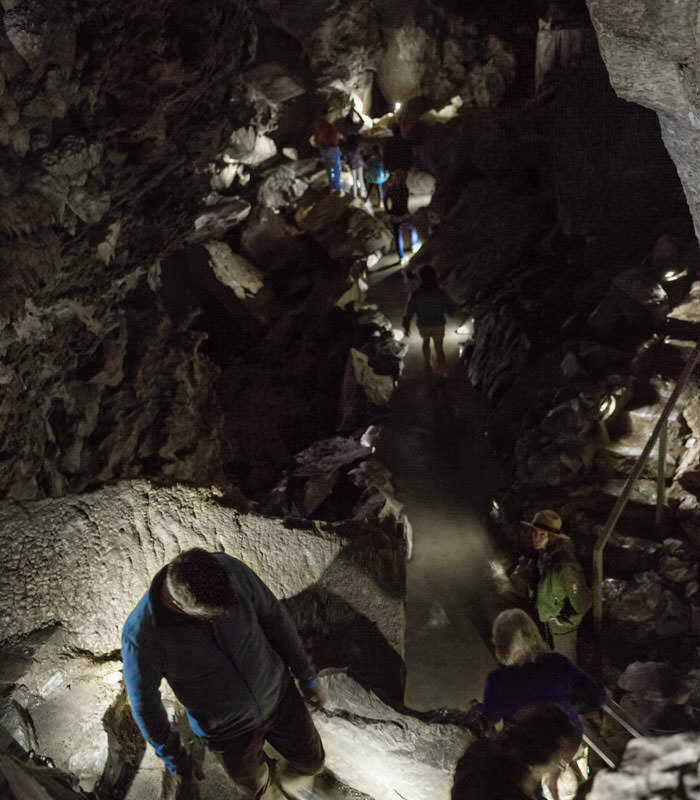 Preserved by President Taft, visitors still flock to explore the caves more than a hundred years later. We took a tour guided by a ranger and learned about the formation of the marble: small sea life in the waters around the former island chain grew shells made of calcite; their bodies drifted to the ocean floor, layer upon layer, until limestone was formed; the heat and pressure of the oceanic plate being forced beneath the continent metamorphosed the limestone into marble; and the heated rock rose back up to the surface, creating the Siskiyou Mountains. 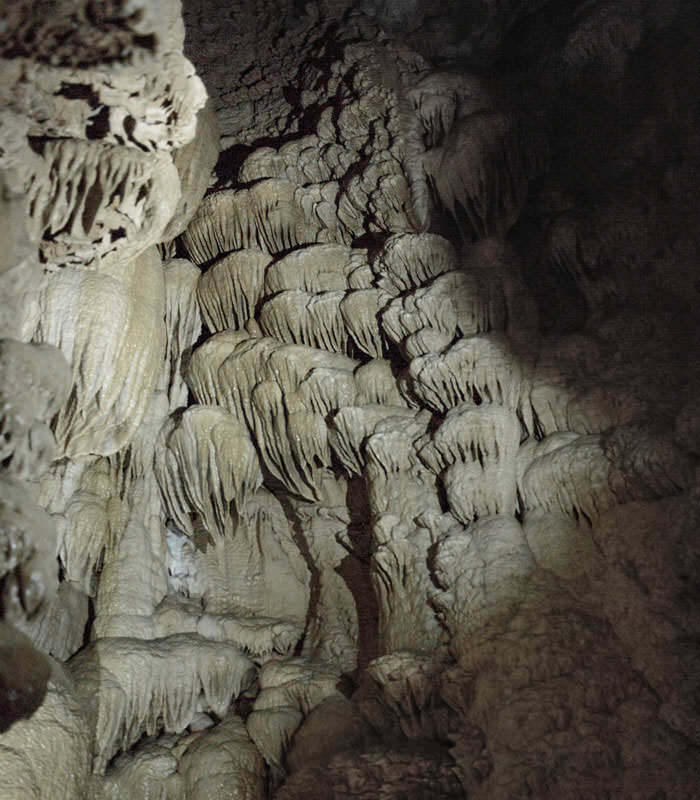 As water poured and dripped from above ground, it hollowed out the caves, and the calcite was left behind in fanciful forms as the water evaporated. Delicate white stone blossoms hanging down from above us reminded me of the Alhambra’s mocárabe ceilings. The “marble halls,” chambers and passageways were also reminiscent of the magic and adventure of Aladdin’s cave or a great sultan’s palace from The Thousand and One Nights. 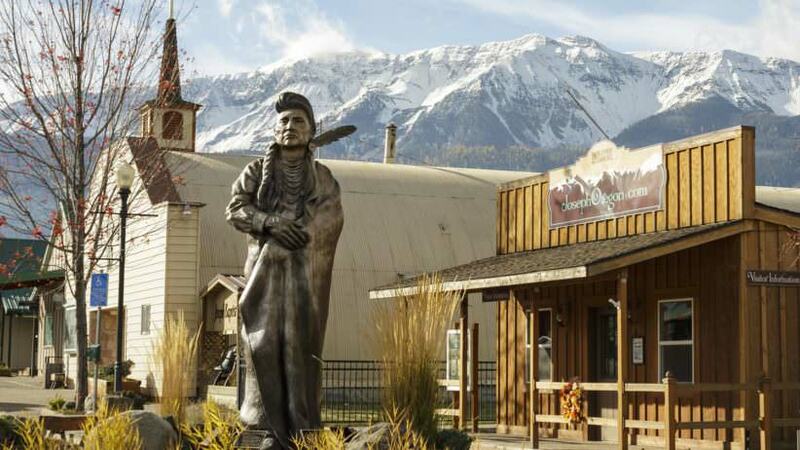 After being transported to another world, we were transported to another time, as we sat down to eat in The Chateau at the Oregon Caves, the monument’s lodge. The lunch counter, though built in the 1930’s, has a 1950’s vibe, from the malted milkshakes to the dulcet sounds of Ray Orbison wafting through the air. Diners also sat beside the waterfall that was created by Civilian Conservation Corps workers from the River Styx, the stream that runs through the caves and down the ravine over which the lodge was built. 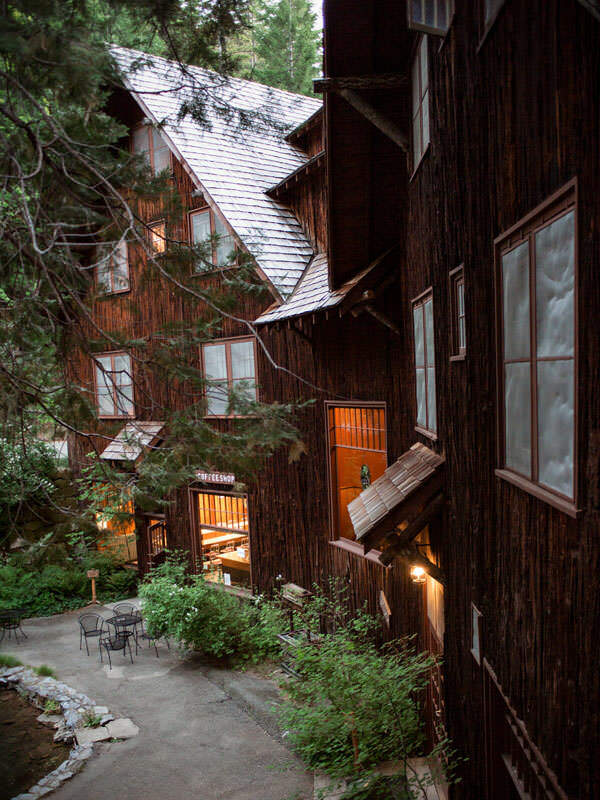 The building is a beautiful example of Park Service architecture, made of the natural materials of marble, Douglas fir, madrone and Port Orford cedar from around the building site, harmonizing with its surroundings. 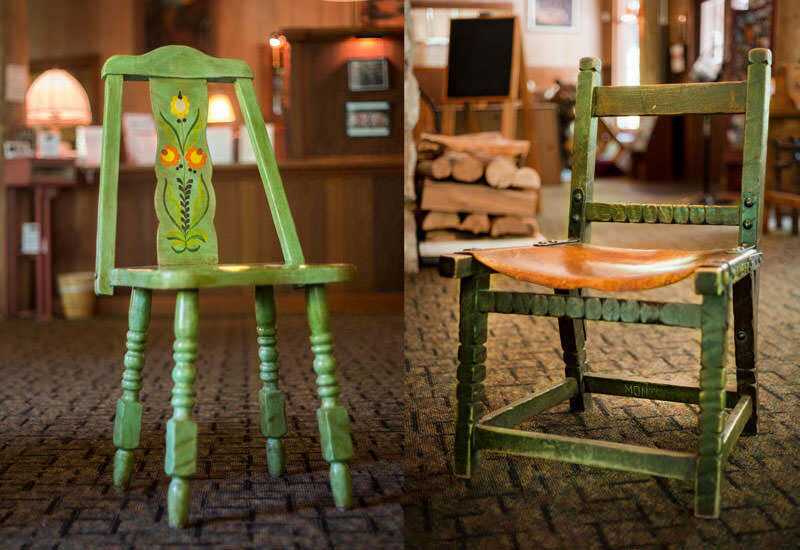 It’s also furnished with Mason Monterey furniture, designed and crafted in the 1920’s by Oregon furniture makers Frank and George Mason, but inspired by California’s Spanish missions. 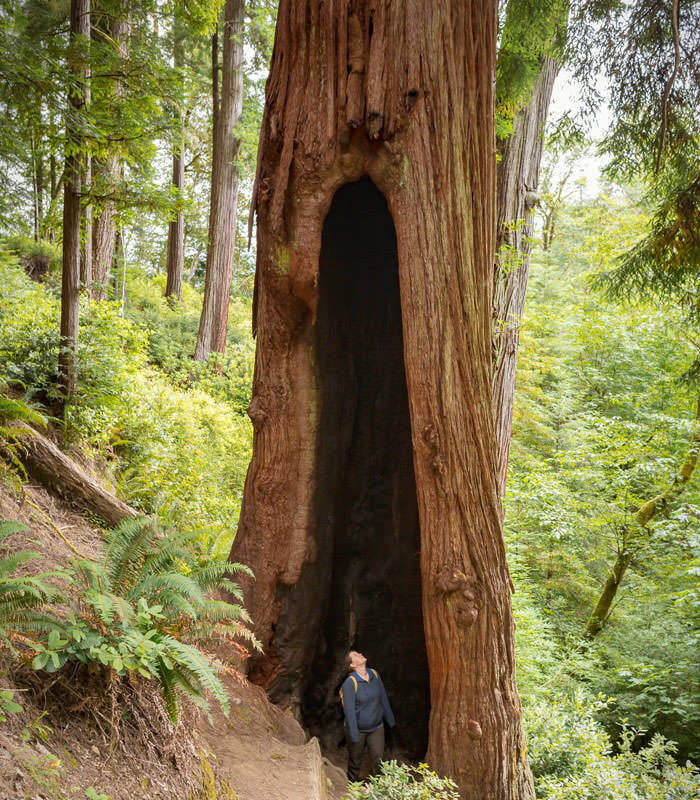 Once we checked-in to our reserved room, we set out for a hike up to Big Tree, the largest known Douglas fir in Oregon, estimated to be 1,200 years old. Though the hike was a bit tough on us after all of our other on-foot excursions, it was worth it to see a tree so ancient and gnarled by time that its branches were as big as normal trees — its sheer presence majestic and humbling. Fully worn out by the time we got back to the lodge, we plopped down on a plump sofa in the lobby and relaxed to music being played by a visitor on the baby grand piano. That night we slept soundly to the soothing rush of the waterfall outside our open window. On our final day of travel, we journeyed south to Mt. Ashland, which was formed by molten granite being forced up from below the shale of the sea floor when the Klamaths’ ancient island chain merged with North America. We hiked a popular section of the Pacific Crest Trail, through a grove of Shasta red fir to a lush meadow full of wildflowers — red columbine, blue stickweed, red-orange paintbrush, white and purple asters and yellow arnica, to name a few. Small orange butterflies flitted everywhere among the busy bees and friendly black and yellow dragonflies. Through another patch of woods, a second meadow gave us a view of both the valley below and the great snow-covered peak of Mt. Shasta in California. 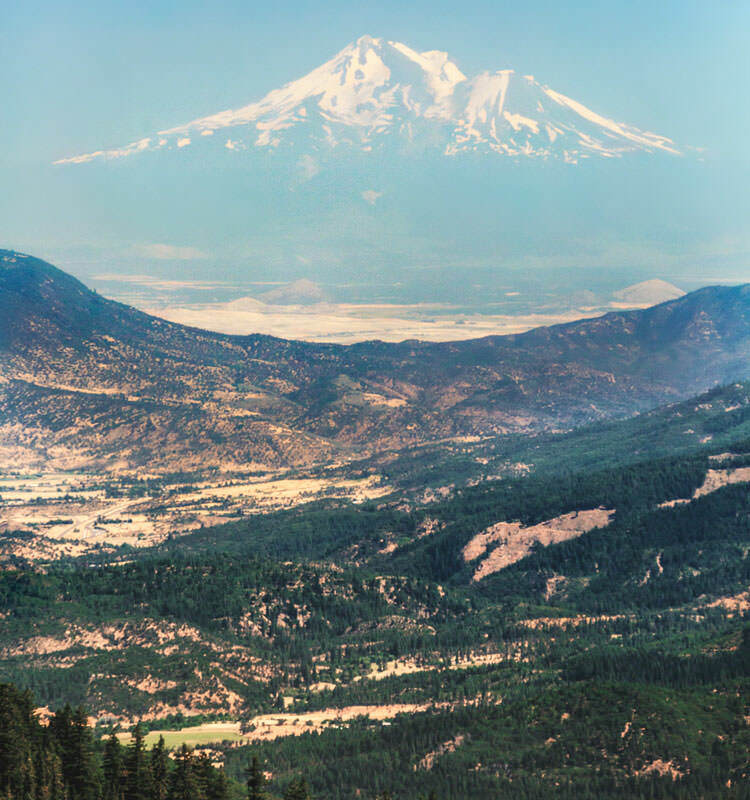 Sitting among the flowers, listening to birdsong in the trees and the babbling of a nearby stream, we gazed at the volcano that is the center of the world to the indigenous Shasta people. To them it is Waka-nunee-Tuki-wiki, which means “to walk around and around, but never on top,” and it is both the creator spirit and its home — a most sacred place, to only be traversed when seeking purification. I thought of how purified my spirit felt after my time in the Klamath Mountain region and of how its ocean waters, cave depths and mountain sides have always been a refuge for life. I hope they will always will be, until the geological forces of the Earth and time transform them into something else, once again. 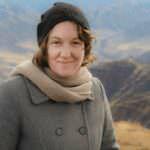 Emily Wahl is an independent media producer who runs a small company with her photographer husband, Eric Macey, in Portland. Emily is passionate about sharing her love of her home state’s beautiful outdoors and its natural and cultural history with her fellow Oregonians and travelers from afar. She is developing a Grand Tour of Oregon on her blog oregongrandtour.com.